9th in a continuing series about PA equipment. Discovering the different facets of a portable speaker can be half the fun of using one. In our previous blog in the PA series, we covered the speech/mic switch and how it adjusts the frequency spectrum of the incoming audio signal. This time, we’ll continue the same thread but will focus instead on the “mic impedance” function found on the 30 Watt PresentationPro™ speakers. When setting up the speaker, it’s important to understand the PA’s volume is affected by which type of wired microphone is connected to it. 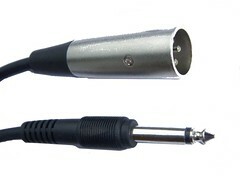 For example, condenser and dynamic microphones have different impedances. The impedance switch on the PA can be switched between High and Low settings to get the best performance from these different types of microphones. The 30 Watt PresentationPro accepts balanced and unbalanced mics with its mic impedance switch. The different settings for the switch may produce different volume levels, feedback, noise, and distortion. We recommend that you switch between the high and low settings to find the best sounding setting for your microphone and PA setup. Please be cautious when switching between high and low settings as the volume may change drastically. Understand this setting is not a definitive “right or wrong” choice, but is more a personal preference in how it sounds to you. 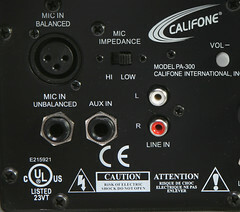 The mic impedance on the PA300+UHF only affects wired microphones connected to it and does not have an effect on handheld or hands-free wireless microphones. This valuable tool ensures that there is not a loss of signal strength and the projection of your voice can be heard at its designated volume level. Rest-assured that by matching a connected wired microphone to its corresponding mic impedance on the portable speaker, you will then obtain a better and more reliable overall sound quality. Read the next article or go back to the first article in the series.